Reaching People and Touching Lives around the World: A Window of Opportunity for Global Outreach. The God we serve is a global God. He has called all believers to “Go into all the world and preach the gospel to all creation” (Mark 16:15 NASB). During these times of worldwide turmoil, Christians who have a desire to serve as global witnesses for Christ can boldly step forward, knowing that God’s mandate to all believers is growing closer to fulfillment. God has given His Church everything needed to do as He commanded. Now is the time to go, because there is a window of opportunity. This book will provide enlightenment in the areas where change must take place so that the body of Christ can make a united global effort to take on the challenges of this world. ABOUT THE AUTHOR: Dr. Tracy and Linda V. Sharpe have a combined total of over thirty years in ministry. Tracy received a doctor of ministry degree from Friends International University and a master of arts degree in organizational management from the University of Phoenix. After serving twenty years in the United States Army and attaining the rank of major, Tracy, along with his wife Linda, founded Heart of Compassion Missionary Ministries. Prior to their marriage, Linda was involved in cross-cultural ministry in Zimbabwe for over eighteen months under the direction of Bishop Tudor Bismark. This selfless devotion to missions inspired Dr. Sharpe to go with her into the world to preach the gospel. Their love for ministering to the lost and helping orphaned children has inspired them in a joint effort with Pastors Ivy and Martin Bernard of Christ-Like Ministries to construct Heart of Compassion Children’s Home. 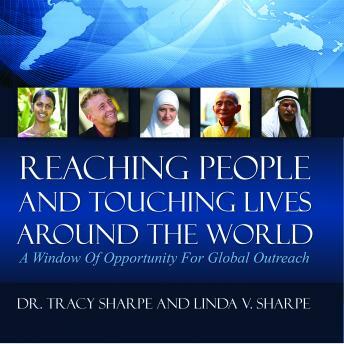 Dr. Tracy and Linda Sharpe are dedicated to reaching people and touching lives around the world.